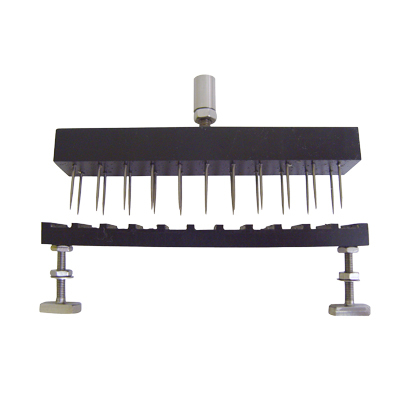 The TMS multiple probe fixture consists of matching upper and lower parts to penetration test multiple individual samples of baton-shaped products. The upper accessory has an array of 20 stainless steel needle tipped rods arranged in rows of pairs. 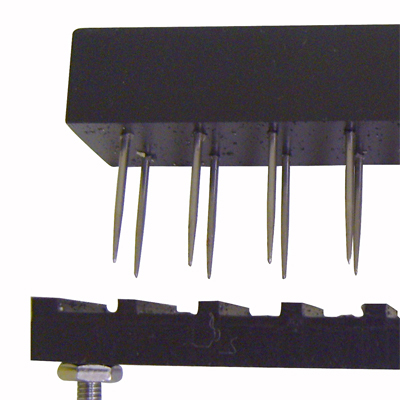 The lower fixture aligns flat raised supporting surfaces to present the product sample(s) to an individual needle probe. By placing a sample across the supports, bridging the gap, the middle of the sample is presented to the probe, with clearance below to allow for complete penetration. If required, the pitch of the needles and supports may be modified to accommodate other products – contact FTC with your own specification. Set of 20 stainless steel rods with corresponding base holder for the measurement of French fries and other baton shaped products. Easily adapted for use with bean and berry shaped samples at customers request.